My Mom always made the best skillet fried chicken strips growing up. They were better than what we could order at any restaurant and certainly became one of my favorite comfort foods. Now, as a mom myself, I often find that my children’s comfort foods are the same as my own. Not by chance, of course. What made me feel good as a child, and even now, is the first thing I make for my kiddos when they need something that reminds them they are home. Making a batch of fried chicken is not nearly as difficult as one may think. In fact, in no time at all, you could also be treating your family’s taste buds to the most scrumptious and, in this case, tangy goodness. And, they will thank you. Using scissors, cut each breast in to strips. Set aside. 2. Empty sleeve of crackers in to a large Ziploc bag and crush. Add dressing mix to bag and shake well. Pour in to a dish and set aside. 3. Heat skillet and coat bottom with olive oil. Keep on medium heat. 4. Crack two eggs in a separate bowl and beat well. Wet each piece of chicken with egg and coat with cracker crumbs. 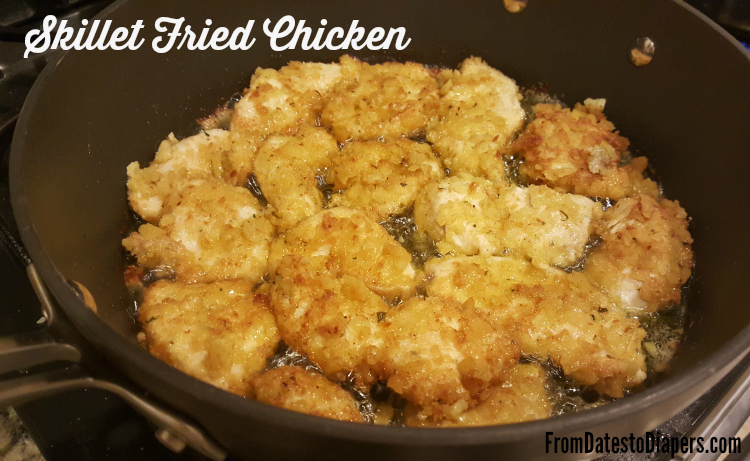 Place chicken strip in to the hot skillet and fry each side until well cooked. 5. Serve with a side of Hidden Valley Greek Yogurt Ranch Dressing and enjoy! Our fried chicken may soon become one of your comfort foods, but I’d love to hear what some of yours may already be!